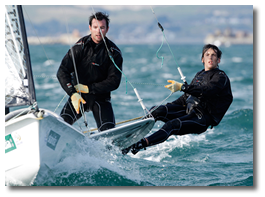 We are pleased to announce that this year we will be sponsoring and providing online marketing support to the 49er Class sailing team of Seaton & McGovern who are representing Ireland in the 2012 London Olympics. Ryan Seaton & Matt McGovern teamed up in April 2009, Matthew is regarded as one of the best 49er crews in the world and has the previous experience of an Olympic campaign in 2008 with his brother Russell. Ryan was mounting a successful campaign in the single handed laser dinghy class, his best ever result being a 5th overall place in the World championships at just 18 years of age. These two sailors have combined their talents, passion & determination for success to make it to London 2012 and compete against the world best sailors. We are really happy to be helping the team and wish them all the success in the Olympics, we’ll keep you updated with their progress on the news sections of this site.